Persistent cough: is it asthma? The aim of this study was to determine if children in the community with persistent cough can be considered to have asthma. A validated questionnaire was given to the parents of 1245 randomly selected children aged 6–12 years. Atopy was measured with skin prick tests. Children with persistent cough had less morbidity and less atopy compared with children with wheeze. Although the syndrome commonly referred to as “cough variant asthma” could not be shown in this study, a significant number of children with persistent cough had been diagnosed as having asthma and were treated with asthma medications including inhaled corticosteroids. Studies are urgently needed to determine the appropriate treatment for children with persistent cough. Many children with persistent cough are diagnosed as having asthma.1 2 However, such studies have looked at clinic attendees who are unlikely to be representative of children in the community. In a study in Australia approximately 10% of 8–11 year old children had “troublesome night cough” but did not wheeze, and had a similar rate of allergic sensitisation and airway hyperresponsiveness (AHR) to the asymptomatic group.8 Because allergic sensitisation and AHR have been previously reported to be strongly associated with asthma,9-11 this suggests that troublesome night cough may have different origins from asthma. It is possible that children who cough have a different disease from children with persistent wheeze whose airways may have a different pathology and a different ability to constrict. Clinical studies show that children with persistent cough but without wheeze have normal lung function but have AHR to histamine and to methacholine similar to that in asthmatics.1 12 Also, children with persistent cough may respond to therapeutic treatment with bronchodilators or steroids, although the cough recurs within three months of stopping treatment.12 As such, cough that is recurrent, more troublesome in the evening or early morning, and usually non-productive has been accepted as an important symptom in making a clinical diagnosis of asthma,13 and in some children this has been reported as the only symptom of asthma.1 14 However, clinic attenders with persistent cough are unlikely to be representative of children in the community with this syndrome and may have symptoms with a different aetiology. Because there seem to be both similarities and differences between wheeze and cough syndromes it is important to establish whether they represent similar or different phenotypes and to clarify whether the inconsistent results between epidemiological and clinical studies are a result of the subject selection criteria or the symptom description used to characterise the syndrome. A list of public schools within a 10 km radius of Royal Prince Alfred Hospital, Sydney, Australia, was compiled. Classes from kindergarten to year 6, which comprised children aged 6–12, were sampled. All public primary schools with school years from kindergarten to year 6 were selected. Schools with fewer than 80 pupils were excluded for logistic reasons. Questionnaires were distributed to a total of 1600 children. A participation of 70% was expected, which would have given a sample size of approximately 1150. Children were invited to participate in this study through a letter to parents or guardians. Before the study, a team member visited classes to remind children to return questionnaires and to answer any questions the children had. A reminder letter was sent home to parents with an attached consent form, and second questionnaires were issued at testing. As far as possible, all non-responders were surveyed to assess possible sampling bias. Each non-responder was given an option to fill out the questionnaire only, without having a skin prick test, and in cases where they refused, they were asked whether any medication for asthma had been used in the previous 12 months. Children who were studied were also asked exactly the same question for comparison. A self administered questionnaire to parents was used to measure respiratory symptom history, frequency of symptoms, medication use, and the morbidity caused by asthma and persistent cough (cough lasting more than three weeks). The questionnaire was a slightly modified version of one developed by the department of respiratory medicine at the University of Sydney.15 The validity and repeatability of the new questions to measure the morbidity of cough was established.16 The questions included recent symptoms relating to the previous 12 months before the study and the presence of respiratory symptoms since birth. Symptom frequency was used as a measure of the severity of asthma and persistent cough. Questions of putative environmental risk factors—that is, home environment details, family history, allergies, parental smoking, and diet—were also included. Each child had his/her questionnaire checked for completeness and parental consent signature. When incomplete, parents were telephoned or the questionnaire returned with a reply paid envelope and a request to complete. When necessary, non-responders were contacted by telephone to retrieve the questionnaire. Atopy to eight common allergens (house dust mites (two species), rye grass, molds (two species), house dust, cats, and cockroaches) was measured by skin prick tests. Recent wheeze was defined as the presence of wheeze or exercise wheeze in the previous 12 months, and persistent cough was defined as the presence of a cough lasting for more than three weeks without a cold or flu in the previous 12 months. Atopy was defined as a wheal size of 3 mm or more to any of the allergens. The 1178 children were divided into three mutually exclusive groups. The first group consisted of children who had been asymptomatic in the previous 12 months (n = 867; 73.6%), the second group consisted of children with a persistent cough without wheeze (n = 56; 4.8%), and the third group consisted of children who had recent wheeze (n = 255; 21.6%). Figure 1 illustrates the patterns of use of medical services in these three groups of children. Significantly more children with persistent cough had been diagnosed as having asthma by a doctor compared with asymptomatic children (p < 0.001) but the numbers were significantly less than in children with wheeze (p < 0.001). The proportion of children who visited a doctor routinely—that is, saw a doctor for asthma at least once every six months was significantly higher in the persistent cough group than in the asymptomatic group (p < 0.001) but was significantly less than in the wheeze group (p < 0.01). Similar proportions of children with persistent cough and asymptomatic children had visited a hospital casualty unit, whereas no child with persistent cough and only three asymptomatic children had been admitted to hospital because of breathing problems in the past 12 months. 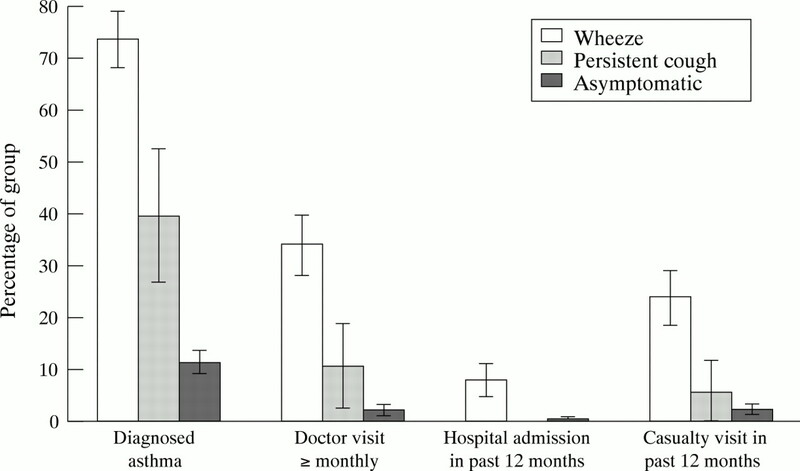 Significantly more children with wheeze had visited a hospital casualty unit and had been admitted to hospital for breathing problems compared with both asymptomatic children and children with persistent cough (p < 0.01). Use of medical services for asthma in 1178 Sydney schoolchildren with wheeze, persistent cough, or asymptomatic. 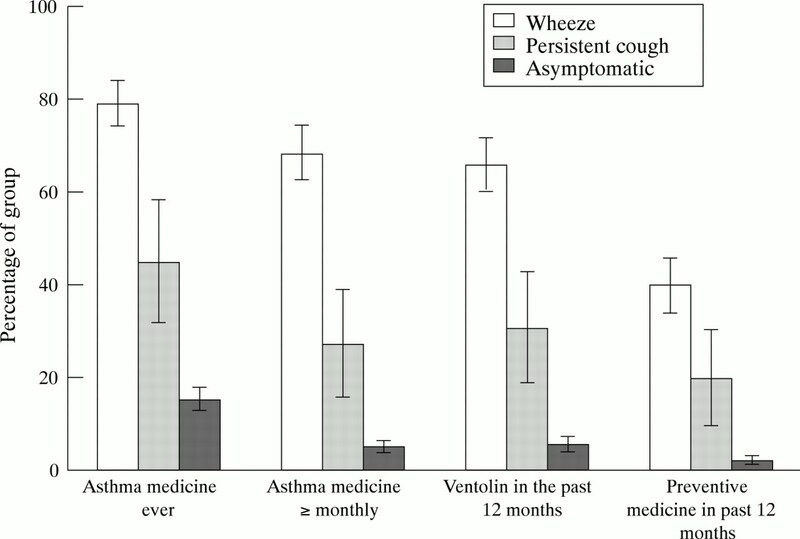 Figure 2 shows that significantly more children with persistent cough had ever used asthma medication, used a bronchodilator (for example, ventolin), or preventive medication (intal or becotide) in the past 12 months, and used asthma medication regularly (at least once a month) compared with asymptomatic children, but this was significantly lower than in children with wheeze. Asthma medication use in 1178 Sydney schoolchildren with wheeze, persistent cough, or asymptomatic. Figure 3 shows that the proportion of children with persistent cough who had limited activity on some days was significantly higher than in the asymptomatic group. The proportion of children who had missed school on some days due to breathing problems was similar in the persistent cough and asymptomatic groups and was significantly less than in the wheeze group (p < 0.001). Similar proportions of children with wheeze and persistent cough had disturbed sleep on some nights and this was significantly more than in the asymptomatic group (p < 0.001). However, significantly more parents of children with persistent cough had disturbed sleep compared with parents of children with wheeze and asymptomatic children (p < 0.001). Morbidity associated with asthma in 1178 Sydney schoolchildren with wheeze, persistent cough, or asymptomatic. Figure 4 shows that similar proportions of children in the groups with persistent cough and asymptomatic groups were atopic but these were significantly lower than in the group with wheeze (p < 0.001). There was no significant difference in the proportion of children with persistent cough who had an early respiratory infection—that is, before the age of 2 years—compared with the wheeze and asymptomatic groups. However, a significantly higher proportion of children with wheeze had an early respiratory infection compared with asymptomatic children (p < 0.001). The proportion of children with persistent cough who had hay fever in the previous 12 months was significantly higher than in asymptomatic children (p < 0.001), and significantly less than in the wheeze group (p < 0.05). 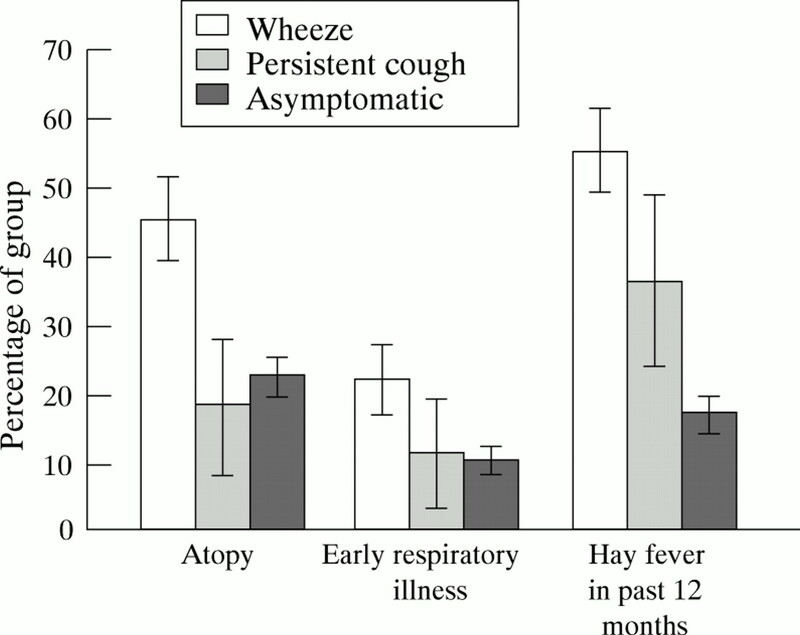 Atopy, early respiratory infection, and hay fever in 1178 Sydney schoolchildren with wheeze, persistent cough, or asymptomatic. 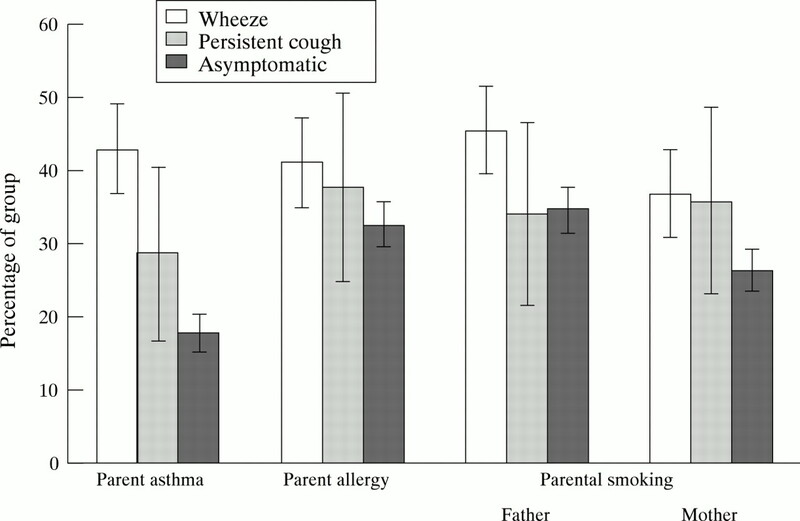 Figure 5 shows that there was no significant differences in the proportion of the parents who had asthma or allergy, or who smoked cigarettes in children with persistent cough compared with children with wheeze and asymptomatic children. However, a significantly higher proportion of parents of children with wheeze had asthma (p < 0.001) or allergy (p < 0.05) and smoked cigarettes (p < 0.01) compared with parents of asymptomatic children. Parental asthma and allergy, and exposure to parental cigarette smoking in 1178 Sydney schoolchildren with wheeze, persistent cough, or asymptomatic. This study showed that children with persistent cough in the community do not have an illness that has common features with asthma. This is in agreement with recent cross sectional studies in schoolchildren that have shown that persistent cough in the absence of wheeze differs in important respects from classic asthma and resembles the asymptomatic population more closely.5-7 Despite this, we found that children in this study with persistent cough have higher rates of a diagnosis of asthma, asthma medication use, and use of medical services than asymptomatic children, but have much lower rates than children with recent wheeze. In addition, children with persistent cough were similar to asymptomatic children with respect to the history of a respiratory infection in early childhood, a family history of asthma or allergy, exposure to parental smoking, atopic status, and morbidity associated with asthma. This suggests that children with persistent cough are unlikely to have asthma and should not be labelled as having cough variant asthma for epidemiological purposes. Our finding that significantly more children with persistent cough used asthma medication compared with asymptomatic children, might be a reflection of the higher proportion of children with persistent cough who had been diagnosed by a doctor as having asthma compared with asymptomatic children. Nevertheless, no child with persistent cough had been admitted to a hospital in the 12 months preceding the study and a similar proportion to asymptomatic children had visited a hospital casualty, whereas 8% of children with wheeze had been admitted to hospital and 24% had visited a hospital casualty (p < 0.01). 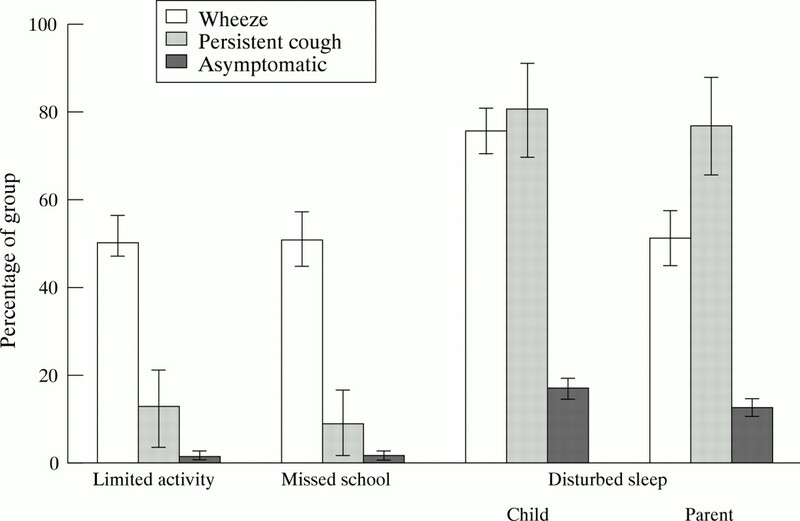 Similar proportions of children with persistent cough and asymptomatic children reported limited activity and school absenteeism due to breathing problems, which was significantly less than in the wheeze group. This suggests that children with persistent cough have an illness with less morbidity but more likely to affect lifestyle than children with wheeze. Children with persistent cough appear to have an illness with a very different aetiology from children with wheeze. Children with persistent cough had similar prevalence of atopy to asymptomatic children, and atopy has been found to be one of the most important risk factors for asthma.9-11 In addition, similar proportions of children with persistent cough and asymptomatic children had parents with asthma or allergy, or who smoked cigarettes. Cough variant asthma was first descried by Glauser in 1972.19 In hospital based studies cough has been reported to be the most common cause of asthma in children.1 4This type of asthma was said to be mild and was referred to as cough variant asthma.20 Subjects within this classification generally have similar prevalence of risk factors (atopy, family history of asthma, and allergy) to classic asthma—that is, children presenting mainly with wheeze.21 All of these studies have been hospital based, however, and the children studied were usually referred to these tertiary centres. As such, the subjects in these studies were highly selective and the results are inappropriate for generalisation to the community. Clinical follow up studies of children with persistent cough have suggested that a significant proportion of them go on to develop asthma or respond to asthma medication treatment.21 22 These studies have not, however, followed up asymptomatic children in the long term to determine if the proportion of children with persistent cough who go on to develop asthma was significantly higher than the proportion in the asymptomatic group. We conclude that cough variant asthma is probably a misnomer for most children in the community who have persistent cough. However, the aetiology and natural history of persistent cough in these children remains unknown. It is important that longitudinal studies to determine if children with persistent cough have a different prognosis from asymptomatic children are undertaken and that the appropriate treatment for children with persistent cough established. (1981) Chronic cough in children: a manifestation of airway hyperreactivity. Pediatrics 67:6–12. (1994) Outcome of cough variant asthma treated with inhaled steroids. Ann Allergy 73:478–480. (1991) Cough-type asthma: a review. Ann Allergy 66:278–285. (1991) Chronic cough in infants and children: an update. Laryngoscope 101:596–605. (1996) Recurrent cough in childhood and its relation to asthma. Am J Respir Crit Care Med 153:1259–1265. (1995) Prevalence and characteristics of children with chronic respiratory symptoms in eastern Finland. Eur Respir J 8:1155–1160. (1995) Persistent nocturnal cough in childhood: a population based study. Arch Dis Child 73:403–407. (1994) Asthma severity and morbidity in a population sample of Sydney schoolchildren: Part I: prevalence and effect of air pollutants in coastal regions. Aust NZ J Med 24:168–175. (1991) Specific allergens evoking immune reactions in the lung: relationship to asthma. Eur Respir J 4 (suppl 13) 68S–77S. (1991) Relation between airway responsiveness and serum IgE in children with asthma and in apparently normal children. N Engl J Med 325:1067–1071. (1991) Sensitivity to common allergens: relation to respiratory symptoms and bronchial hyper-responsiveness in children from three different climatic areas of Australia. Clin Exp Allergy 21:573–581. (1979) Chronic cough as the sole presenting manifestation of bronchial asthma. N Engl J Med 300:633–637. (1975) Exertional dyspnea and cough as preludes to acute attacks of bronchial asthma. N Engl J Med 292:555–559. (1982) Cough variant asthma in children. JAMA 247:206–208. (1987) Bronchial hyperresponsiveness in two populations of Australian schoolchildren I. Relation to respiratory symptoms and diagnosed asthma. Clin Allergy 17:271–281. Faniran AO, Peat JK, Woolcock AJ. Measuring persistent cough in children in epidemiological studies: development of a questionnaire and assessment of prevalence in two countries. Chest [In press.]. (1996) Clinical significance of cough and wheeze in the diagnosis of asthma. Arch Dis Child 75:489–493. (1997) Accuracy of asthma treatment in school children in NSW, Australia. Eur Respir J 10:658–664. (1972) Variant asthma. Ann Allergy 30:316–321. (1985) Chronic cough: diagnosis and treatment. Primary Care 12:217–225. (1987) Chronic cough as a risk indicator of broncho-pulmonary disease. Eur Respir J 71:77–85. (1991) Two-year follow up of the management of chronic or recurrent cough in children according to an asthma protocol. Br J Gen Practice 41:406–409.